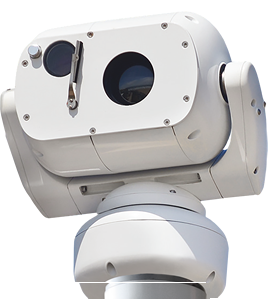 The Aeron TI is the perfect solution for mid - long range surveillance applications, providing the best performance available within a marine grade rugged pan and tilt casing of this size. The Aeron TI employs DRS’ proven un-cooled of 320 x 240 (DA) and high resolution 640x480 (DB), 17μm VOx thermal imaging technologies to provide man detection up to 3.4 kilometres. The thermal imager utilises ICE to enhance contrast and features fixed or zoom lenses of 3x or 6x optical zoom, unique in a housing of this size. All models also offer simultaneous video verification provided by a 40x zoom module or a 30x HD zoom module. The Aeron TI is fully housed within a hard anodised aluminium casing, fully rated to IP67 and ready to handle the harshest environments. The toughened, optically flat glass provides clear images, even at the highest zoom levels and can be kept clean at all times by the compact wiper unit. Optical encoders for both the pan and tilt axes provide highly accurate positioning and repeatability, allied with self correction.